I can’t find the artist “Bennett” anywhere – who made my bolo tie? I have looked everywhere on line and in books and I can’t find any information on at artist, perhaps Bennett Pat or Pat Bennett whose name is on the back of my bolo tie. Can you help? stamped on the locking slide on the back of your bolo…yes? Although the above indicates that a patent had been applied for, there is no patent registered according to anything I have read. It is my opinion and experience that soon thereafter, others began copying the clasp so the copy-cats didn’t add the BENNETT name on it. We refer to unmarked clasps as “Bennett-style” clasps. I’ve seen unmarked locking clasps on bolos made from the 1960s through til today. The marking on your bolo slide might be a partial stamp that made you think it said “BENNETT PAT”. You should look carefully all over the back of the bolo itself (not the slide) for any kind of marks – often these are quite light as they are sometimes done with an engraver. That information plus a photo of the front of the bolo would be helpful in determining the origin, and perhaps the artist who made your bolo. Can you Help me With OLD Bolo Hallmarks? I came by your information by chance and thought I would see if you could help me with some Native American jewelry Hallmarks on bolos. First is a horse shoe type with an arrow over rays or other arrows. The other is a dancer with a simple hand engraved T I H. Both are quite old, somewhere between the 1930’s and perhaps early 1950’s. Both your Naja and Knifewing bolos seem to be quite old, with hand made bolo slides – before the popular Bennett bolo slide appeared on the scene. First the Naja with an arrow and rays. Read more about the Naja here. I don’t recognize the hallmark and do not see it in any of my hallmark reference books. Next the Knifewing with TIH. Read more about Knifewing here. 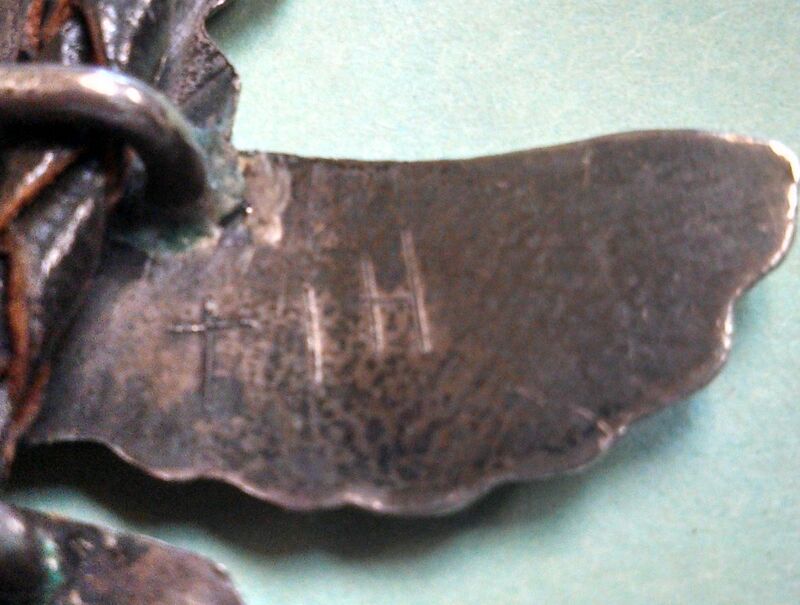 I looked it up as you suggested with TIH and also as a cross followed by IH which is what it seems to me. I came up empty. Perhaps a reader of this blog might recognize these old marks.